Introduction: There is a worldwide increase in the prevalence of obesity among the adolescent population in India from 16.3% in 2001 to 19.3% in 2010. Recent evidence suggests that bariatric surgery leads to resolution of comorbidities and associated long-term complications in adolescent patients with morbid obesity. Aim: The aim of this study is to determine the impact of bariatric surgery on the weight loss and comorbidities of morbidly obese adolescents. Materials and Methods: A retrospective review of the data of 10 adolescent patients, who underwent Laparoscopic Sleeve Gastrectomy at our institute (tertiary care hospital), from July 2009 to July 2016 was carried out. Results: Of the 10 patients, 4 patients had syndromic forms of obesity. The median age was 16.54 years. The median pre-operative weight and height were 112 kg and 154 cm, respectively, with a body mass index of 47.2 kg/m2. There was no intra-operative or post-operative complication except for suspected methylene blue toxicity in one patient which was treated conservatively. Median follow-up period was 1 year (0–5 years). The patients had an increase in excess weight loss (EWL) of 54.5% until the end of 1 year. There was a regain of weight between the 1st and 2nd year, followed by a sustained weight loss achieving 44.8% EWL at 3 years and 60% at the end of 5 years (only two patients followed up at 5 years). Similar results were found in syndromic patients. Among the four diabetic patients, three had complete resolution and one had improvement in diabetes status. Among the three patients with obstructive sleep apnoea, two patients had complete resolution, while one patient had improvement in symptoms. One patient with hypocortisolism improved after surgery with a decrease in the steroid requirement. Among the hypothyroid patients, one patient had a complete resolution, one patient had improvement in hypothyroid status while two patients had no change. Conclusion: Bariatric surgery is effective for morbidly obese adolescents, leading to significant resolutions of comorbid illness. The problem of childhood obesity has gained significant attention as the majority of them are found to develop morbid obesity in adulthood.,, Childhood obesity is also associated with various psychosocial problems such as depression and low self-esteem that affects the quality of life. It is also associated with early-onset atherosclerosis, hypertension, diabetes mellitus, non-alcoholic steatohepatitis and reduced life expectancy. Thus, it is important to treat these patients at an early age to avoid long-term complications. Childhood obesity is seen in genetic syndromes such as Prader Willi syndrome. Mortality associated with syndromic forms is usually due to obesity-related complications. Surgical weight loss procedures have shown promising results in patients who have failed to respond to medical therapy in both the syndromic and non-syndromic forms of childhood obesity. Recent studies have demonstrated that bariatric surgery led to resolution of comorbidities and hence, the hypothesis that early intervention would decrease the associated complications in future.,, However, there are very few studies evaluating the long-term efficacy and safety of the surgery in the adolescent population. The majority of the data about childhood and adolescent obesity are available from North American and European countries with major contributions from Inge et al. and Olbers et al.,, The data in Indian population are lacking. With the problem of adolescent obesity increasing in India and acknowledging the region-specific genetic contributions to the same, this study intends to bring out our experience of bariatric surgery performed in morbidly obese adolescents. To the best of our knowledge, this is the first study in the Indian subcontinent in morbidly obese adolescent population. Prospectively collected database of 10 morbidly obese patients under the age of 18 years who underwent Laparoscopic Sleeve Gastrectomy at All India Institute of Medical Sciences (tertiary care hospital), New Delhi from July 2009 to July 2016 was analysed retrospectively. All the patients belonged to the age group of 12–18 years with a median body mass index (BMI) of 47.2 kg/m2. In accordance with the NIH guidelines, patients with BMI >35 with comorbidities and BMI >40 were included in the study. All the patients fulfilling the above-stated criteria also came under the category of either Class II or Class III obesity according to Skinner et al., These patients were considered to be suffering from morbid obesity. Patients and their parents received interdisciplinary counselling about various surgical and non-surgical options, possible outcomes, possible complications and necessary post-operative lifestyle changes. The patients underwent psychological assessment and counselling by a psychologist. Genetic testing was done for syndromic patients. Under general anaesthesia four ports were placed, two 12 mm and two 5 mm. A self-retaining liver retractor was introduced through a 5-mm incision in the epigastrium. The greater omentum was divided from a point 4 cm from the pylorus up to the angle of his using harmonic. A sleeve was created over a 36 F gastric calibration tube with tristapler Medtronic cartridge. A narrow gastric tube was created by removing a major portion of the stomach along the greater curvature. An intraoperative leak test was carried out using methylene blue to confirm the integrity of sleeve. The patients were followed up at 1 week, 1 month and then at 3-month intervals for the 1st year and then yearly for weight loss, nutritional parameters and comorbidities. The degree of weight loss was assessed using percent excess weight loss (%EWL). According to Brolin et al. criteria, EWL more than 50% was considered to be successful. According to the American Diabetes Association, diabetes mellitus was defined as fasting blood sugar (FBS) ≥126 mg/l, HbA1c level ≥6.5% or if the patient was on oral hypoglycemic medications. Remission was defined as FBS <126 mg/dl and HbA1c level <6.5% without the use of oral hyperglycemic agents or insulin after surgery. Hypothyroidism was considered if the patient required thyroxine replacement therapy to maintain normal T4 and thyroid stimulating hormone levels. An improvement was defined as a decrease in the requirement of thyroxine to maintain euthyroid status. Central hypocortisolism was defined as serum cortisol <18 ug/dl after 60 min of administration of 250 ug of ACTH. An improvement was defined by a decrease in the dose of steroid required to maintain normal serum cortisol levels. The data were entered into MS-EXCEL 2010 datasheet. Statistical analyses were performed by using SPSS version 20 for Windows (SPSS Inc., Chicago, IL, USA). Continuous variables were expressed as mean or median. As shown in [Table 1], ten adolescent patients underwent bariatric surgery from July 2009 to July 2016 of which 50% of patients were male. The mean age was 16.54 years (12–18 years). The median height was 154 cm, median weight of 112 kg and BMI of 47.2 kg/m2. Nearly 40% of them had syndromic forms of obesity (two patients with Prader Willi syndrome and two patients with monogenic obesity). All the patients underwent Laparoscopic sleeve gastrectomy. There were no intraoperative or post-operative complications such as leak, bleed from the staple line or deep vein thrombosis. However, post-operatively, one patient developed symptoms of increased agitation, shortness of breath, tachypnea, unable to maintain normal oxygen saturation with bluish discolouration of skin and mucosa and green coloured urine on the post-operative day 1. A presumptive diagnosis of methylene blue toxicity was made and the patient was managed in an Intensive Care Unit setting with oxygen on mask and patient improved symptomatically. Median follow-up period was 1 year (0.5–5 years). Eight patients completed 1 year follow-up, three patients completed 3 years follow-up, and two patients completed their 5 years of follow-up. Two patients were lost to follow-up. As shown in [Figure 1], the patients had significant weight loss after surgery, the nadir being attained at 1 year. 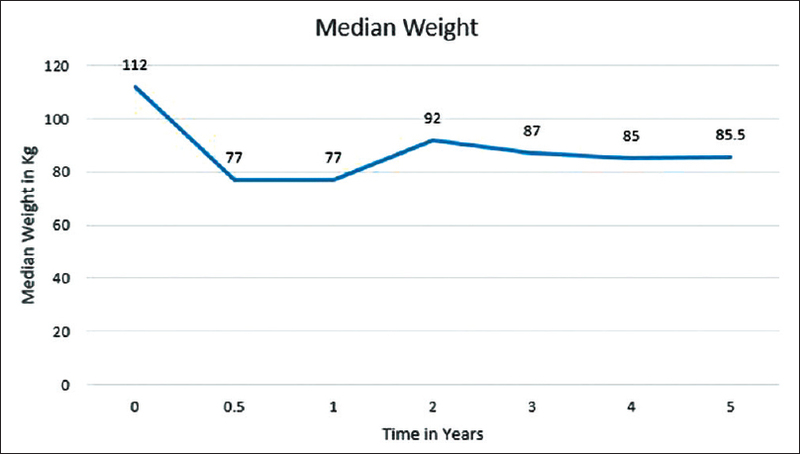 There was regain in the median weight between the 1st and 2nd year, followed by sustained weight loss during the remaining follow-up period till 5 years. 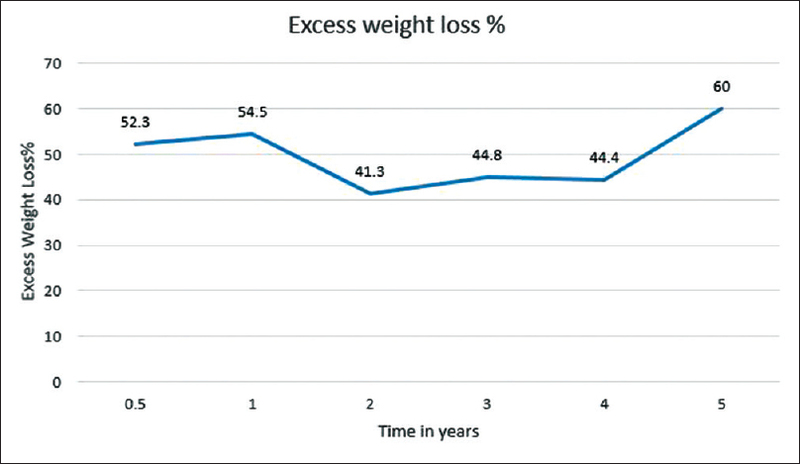 As shown in [Figure 2], excess % weight loss (EWL %) increases for the initial 1 year after surgery reaching 54.5% at the end of the 1st year. After this, there was a decrease in the EWL due to weight regain resulting in EWL % of 44.8% and 44.4% were noted at the end of 3 years and 4 years follow-up period. The EWL of 60% at 5 years which is greater than EWL at 3 or 4 years seems to be because only two patients were available for follow-up at 5 years with %EWL of one of them being 81.8% skewing the value. According to Brolin et al. criteria, five patients (5/8, i.e., 62.5%) had successful weight loss at 1 year, while one patient each had successful weight loss at 3 and 5 years, respectively. Among the four syndromic patients, three patients completed 1 year of follow-up. They had 32% EWL at 6 months and 49% at 1 year of follow-up. As shown in [Table 2], four patients had diabetes mellitus, three patients had obstructive sleep apnoea (OSA) one patient had hypocortisolism, and four patients had hypothyroidism. None of the patients had hypertension or polycystic ovarian disease. Among the four diabetic patients, three (75%) had complete resolution and one (25%) had improvement in diabetes status. However, one patient had developed new onset of diabetes mellitus at the end of the 4th year of follow-up. Among the three patients with OSA, two patients (66.67%) had complete resolution while one patient (33.33%) had improvement in symptoms. One patient with hypocortisolism improved post-surgery with a decrease in the steroid requirement. Among the hypothyroid patients, one patient had complete resolution, one patient had improvement in hypothyroid status while two patients had no change. Bariatric surgery is an effective option for adolescent patients with morbid obesity.,,,, It results in resolution of the comorbidities which results in improvement in the quality of life.,, In this study, all the 10 patients underwent Laparoscopic Sleeve Gastrectomy (LSG) and 8 patients completed a median follow-up period of 1 year (0.5–5 years). The median BMI was 47.29 while the mean age of the population was 16.54 years (12–18 years). Among the weight loss surgical procedures laparoscopic adjustable gastric banding used to be the initial treatment for adolescent obesity due to reversibility and absence of nutritional problems associated with it. However, with the higher reoperation rates and requirement of band removal in up to 50% of adult patients as seen in a study done by Himpens et al. over a 12-year period, this procedure has fallen out of common practice. Laparoscopic Roux en Y gastric bypass (LRYGB) is avoided in adolescent population due to the risk of nutritional deficiency which may have an impact on growth., In view of the same, laparoscopic sleeve gastrectomy has proved to be more effective and safer weight loss surgical option, for adolescents in relation to the other procedures in recent times as shown by various studies.,,, Hence, we preferred to perform LSG in the study population. Inge et al. recruited 242 adolescents for bariatric surgery from various centers across the USA and followed them for 3 years. It was found that weight loss in the adolescents was maximum in the first 6 months followed by a plateau up to 2 years. There was a weight regain between second and 3rd year, but an overall weight loss of 26% among patients undergoing sleeve gastrectomy and 28% among patients undergoing gastric bypass was significant at midterm. Göthberg et al. in a study observed 76% EWL at 2 years of follow-up in 81 adolescent patients undergoing LRYGB. Inge et al. followed 58 patients who underwent LRYGB with a mean age of 17 years. They found that the mean BMI decreased from 58 kg/m2 to 41 kg/m2 at 8 years of follow-up. These patients had a significant resolution of their comorbidities. Olbers et al. in their study on 81 adolescent obese patients, who underwent LRYGB, found a mean reduction in BMI of 13 kg/m2 in the study population. Nearly 72% of the patients in their study also showed some form of nutritional deficiency. Therefore, sleeve gastrectomy might be a better weight loss surgical option for obese adolescent patients who require bariatric surgery. Among the syndromic patients, we saw an EWL of 32% in the first 6 months and 49% by 1 year. Alqahtani et al. in his study of 124 adolescents with Prader Willi syndrome, found that surgical weight loss was significant at 5 years compared with other weight loss strategies. They attributed this to hormonal modulations which decrease the food-seeking behavior. In this study, diabetes mellitus resolved in three patients and improved in one patient post-surgery. These findings could be explained by the fact that bariatric surgery leads to increased gastric emptying and hence glucagon-like peptide 1-mediated insulin secretion. There is associated decrease in ghrelin which increases the serum insulin and decreases in insulin resistance. One of our patients developed diabetes mellitus at 4th year after surgery. This could be probably explained by the fact that the patient had an onset of glucose intolerance before surgery which manifested in the follow-up period. Compared with other studies, Inge et al. had shown significant resolution of diabetes in 95% of the 246 adolescent obese individuals who underwent bariatric surgery results of which are comparable to studies carried out in the adult population. We had three patients with symptoms of OSA. Symptoms of OSA resolved in two patients and improved in one patient. Kalra et al. did a study on 34 obese adolescents of whom 19 had severe OSA. Ten of the 19 patients who were available for follow-up showed significant resolution in OSA. According to the American Society for Metabolic and Bariatric Surgery pediatric committee, bariatric surgery is strongly recommended for obese adolescent patients with apnoea-hypopnoea index more than 15. There was an improvement in steroid requirement in one patient with hypocortisolism 6 months after surgery. However, there have been no studies regarding the effect of bariatric surgery on hypocortisolism, and further studies are required to ascertain the role of bariatric surgery on it. Hypothyroid status resolved in one patient. This is may be due to the decrease in thyroid hormone resistance associated with weight loss and a decreased need of thyroxine supplementation. Among 20 morbidly obese adults, Fazylov et al. had observed resolution of hypothyroidism in 25% patients, improvement in 10% and no change in hypothyroidism in 40% up to 3 years post-bariatric surgery. In this study, no patients had developed intra-operative or post-operative complications. One patient had developed respiratory distress probably due to suspected methylene blue toxicity. The incidence of such complication after usage of methylene blue in surgery is rare and is usually self-limiting. A majority of studies on adolescent obesity are from North American and European countries. This is the first study, regarding bariatric surgery in the Indian adolescents. However, there are certain limitations to this study. The sample size is and the follow-up of all patients could not be completed. To decrease the bias, we have not included the follow-up of one patient post-redo surgery of gastric bypass. Laparoscopic Sleeve Gastrectomy is an effective weight loss surgical option for morbidly obese adolescents, leading to significant resolutions of comorbid illness. However, further studies are necessary to ascertain the efficacy and safety of the surgery in them. The authors would like to thank Mrs Rachna Chowdhary, bariatric programme coordinator for technical support. This is to thank Mrs Rachna Chowdhary, bariatric programme coordinator for technical support. Freedman DS, Mei Z, Srinivasan SR, Berenson GS, Dietz WH. Cardiovascular risk factors and excess adiposity among overweight children and adolescents: The Bogalusa Heart Study. J Pediatr 2007;150:12-700. Thompson DR, Obarzanek E, Franko DL, Barton BA, Morrison J, Biro FM, et al. Childhood overweight and cardiovascular disease risk factors: The national heart, lung, and blood institute growth and health study. J Pediatr 2007;150:18-25. Ranjani H, Mehreen TS, Pradeepa R, Anjana RM, Garg R, Anand K, et al. Epidemiology of childhood overweight and obesity in India: A systematic review. Indian J Med Res 2016;143:160-74. Krebs NF, Himes JH, Jacobson D, Nicklas TA, Guilday P, Styne D, et al. Assessment of child and adolescent overweight and obesity. Pediatrics 2007;120 Suppl 4:S193-228. Ohri-Vachaspati P, Leviton L, Bors P, Brennan LK, Brownson RC, Strunk S, et al. Strategies proposed by healthy kids, healthy communities partnerships to prevent childhood obesity. Prev Chronic Dis 2012;9:E11. Koebnick C, Smith N, Coleman KJ, Getahun D, Reynolds K, Quinn VP, et al. Prevalence of extreme obesity in a multiethnic cohort of children and adolescents. J Pediatr 2010;157:26-3100. Raj M, Kumar RK. Obesity in children and adolescents. Indian J Med Res 2010;132:598-607. Schrander-Stumpel CT, Curfs LM, Sastrowijoto P, Cassidy SB, Schrander JJ, Fryns JP, et al. Prader-Willi syndrome: Causes of death in an international series of 27 cases. Am J Med Genet A 2004;124A: 333-8. Inge TH, Zeller MH, Lawson ML, Daniels SR. A critical appraisal of evidence supporting a bariatric surgical approach to weight management for adolescents. J Pediatr 2005;147:10-9. Inge TH. Bariatric surgery for morbidly obese adolescents: Is there a rationale for early intervention? Growth Horm IGF Res 2006;16 Suppl A: S15-9. Garcia VF, DeMaria EJ. Adolescent bariatric surgery: Treatment delayed, treatment denied, a crisis invited. Obes Surg 2006;16:1-4. Sugerman HJ, Sugerman EL, DeMaria EJ, Kellum JM, Kennedy C, Mowery Y, et al. Bariatric surgery for severely obese adolescents. J Gastrointest Surg 2003;7:102-7. Inge TH, Jenkins TM, Xanthakos SA, Dixon JB, Daniels SR, Zeller MH, et al. Long-term outcomes of bariatric surgery in adolescents with severe obesity (FABS-5+): A prospective follow-up analysis. Lancet Diabetes Endocrinol 2017;5:165-73. Olbers T, Beamish AJ, Gronowitz E, Flodmark CE, Dahlgren J, Bruze G, et al. Laparoscopic roux-en-Y gastric bypass in adolescents with severe obesity (AMOS): A prospective, 5-year, Swedish nationwide study. Lancet Diabetes Endocrinol 2017;5:174-83. Inge TH, Zeller MH, Jenkins TM, Helmrath M, Brandt ML, Michalsky MP, et al. Perioperative outcomes of adolescents undergoing bariatric surgery: The teen-longitudinal assessment of bariatric surgery (Teen-LABS) study. JAMA Pediatr 2014;168:47-53. Skinner AC, Skelton JA. Prevalence and trends in obesity and severe obesity among children in the United States, 1999-2012. JAMA Pediatr 2014;168:561-6. Skinner AC, Perrin EM, Skelton JA. Prevalence of obesity and severe obesity in US children, 1999-2014. Obesity (Silver Spring) 2016;24:1116-23. Deitel M, Gawdat K, Melissas J. Reporting weight loss 2007. Obes Surg 2007;17:565-8. Brolin RE, Kenler HA, Gorman RC, Cody RP. The dilemma of outcome assessment after operations for morbid obesity. Surgery 1989;105:337-46. Expert Committee on the Diagnosis and Classification of Diabetes Mellitus. Report of the expert committee on the diagnosis and classification of diabetes mellitus. Diabetes Care 2003;26 Suppl 1:S5-20. Paulus GF, de Vaan LE, Verdam FJ, Bouvy ND, Ambergen TA, van Heurn LW, et al. Bariatric surgery in morbidly obese adolescents: A systematic review and meta-analysis. Obes Surg 2015;25:860-78. O'Brien PE, Sawyer SM, Laurie C, Brown WA, Skinner S, Veit F, et al. Laparoscopic adjustable gastric banding in severely obese adolescents: A Randomized trial. JAMA 2010;303:519-26. Himpens J, Cadière GB, Bazi M, Vouche M, Cadière B, Dapri G, et al. Long-term outcomes of laparoscopic adjustable gastric banding. Arch Surg 2011;146:802-7. Strauss RS, Bradley LJ, Brolin RE. Gastric bypass surgery in adolescents with morbid obesity. J Pediatr 2001;138:499-504. Inge TH, Courcoulas AP, Jenkins TM, Michalsky MP, Helmrath MA, Brandt ML, et al. Weight loss and health status 3 years after bariatric surgery in adolescents. N Engl J Med 2016;374:113-23. Nadler EP, Barefoot LC, Qureshi FG. Early results after laparoscopic sleeve gastrectomy in adolescents with morbid obesity. Surgery 2012;152:212-7. Alqahtani AR, Antonisamy B, Alamri H, Elahmedi M, Zimmerman VA. Laparoscopic sleeve gastrectomy in 108 obese children and adolescents aged 5 to 21 years. Ann Surg 2012;256:266-73. Boza C, Viscido G, Salinas J, Crovari F, Funke R, Perez G, et al. Laparoscopic sleeve gastrectomy in obese adolescents: Results in 51 patients. Surg Obes Relat Dis 2012;8:133-7. Göthberg G, Gronowitz E, Flodmark CE, Dahlgren J, Ekbom K, Mårild S, et al. Laparoscopic roux-en-Y gastric bypass in adolescents with morbid obesity – surgical aspects and clinical outcome. Semin Pediatr Surg 2014;23:11-6. Kalra M, Inge T, Garcia V, Daniels S, Lawson L, Curti R, et al. Obstructive sleep apnea in extremely overweight adolescents undergoing bariatric surgery. Obes Res 2005;13:1175-9. Michalsky M, Reichard K, Inge T, Pratt J, Lenders C; American Society for Metabolic and Bariatric Surgery. ASMBS pediatric committee best practice guidelines. Surg Obes Relat Dis 2012;8:1-7. Fazylov R, Soto E, Cohen S, Merola S. Laparoscopic roux-en-Y gastric bypass surgery on morbidly obese patients with hypothyroidism. Obes Surg 2008;18:644-7. Ginimuge PR, Jyothi SD. Methylene blue: Revisited. J Anaesthesiol Clin Pharmacol 2010;26:517-20.